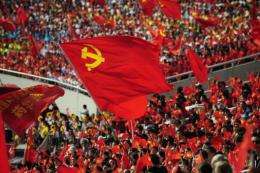 Chinese people mark the 90th anniversary of China's Communist Party in June last year. For the communist cadre who has everything, a shadowy Chinese company is offering a $1,590 tablet computer called the "Red Pad" reserved for the nation's top officials. For the communist cadre who has everything, a shadowy Chinese company is offering a $1,590 tablet computer called the "Red Pad" reserved for the nation's top officials. The pricey device, whose existence was publicised by state media this week, has drawn mocking comparisons to Apple's iPad from Chinese netizens. "The iPad is a symbol of fashion, is this pad a symbol of bigwigs?" read a posting by Vicin Zheng Jun through the popular Sina microblog service. Red is the colour of China's Communist Party and in the political context refers to someone who is patriotic. 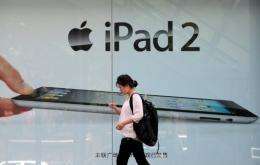 A woman walks past advertising for the iPad 2 in Beijing in June 2011. A planned "red pad" tablet computer for Communist officials in China has drawn mocking comparisons with the blockbuster Apple product. Red Pad Technology, reported to have links to China's powerful Ministry of Information Industry, will not sell the product to the public but only to bureaucrats, state media said. The Red Pad, called the "mobile business platform" for officials, has features such as access to internal documents, the musings of top leaders and a database of government contact information. But the company selling the Red Pad appears to have grown publicity-shy, with its official website no longer accessible. Chinese bloggers said only government officials could afford the tablet since they have access to state funds and illegal sources of income gained through their powerful positions. "Your products should be aimed at those customers who do not spend their own money," said another microblog posting by Su Hailei. In what appeared to be a joke, a seller on China's largest online shopping platform Taobao was offering a "Black Pad" at a cheaper $160 price, saying it beat the Red Pad "used by corrupt officials".